This is not a typical first grade project, but my first grader really wanted a stuffed gnome “big enough to sleep with”. She worked on this gnome once a week from about the end of August or so until the end of March, with some small breaks for wet felting projects here and there. 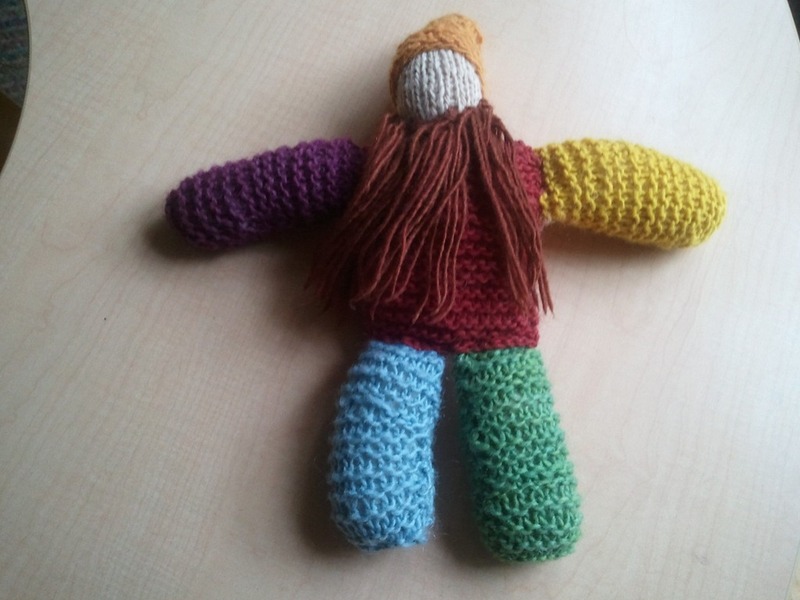 She knit all the different multi-colored squares, and her handwork teacher in our homeschool co-op knit the face of the gnome and did the sewing and stuffing (my first grader also did the beard). This is a sweet project for a child who has patience to make something this large. What a lovely gnome! I love how it is composed of various squares. Here’s a knitted gnome pattern that I’ve used a couple times and really love. It’s “slightly” more complicated than your daughter’s gnome, but not much. It might be another option for a parent of a child who really wants to knit, but needs more guidance from a pattern. what a lovely, beautiful and well-made gnome this is! How beautiful! I bet you are so proud of your little one – shows such patience, determination, and focus to see a project like this through! Great job! I absolutely love it! What a wonderful idea!